The flea is an external parasite, a biting insect, which affects animals. Prevalent throughout the world, the flea species most often found on our pets is the Ctenocephalides felis, the cat flea. Other flea species are also found, such as Pulex irritans, Echidnophaga gallinacea and Ctenocephalides canis. Dark brown color, laterally flattened shape, which facilitates movement in fur or feathers. 3 pairs of legs adapted for jumping. They are covered in bristles, which help them to stay in the fur or feathers. 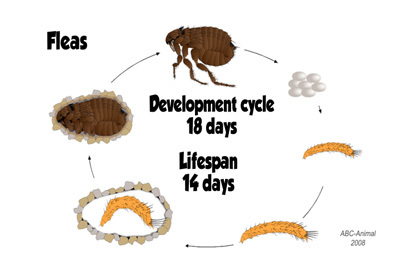 * A flea is only considered a parasite at the adult stage. * Size: up to 3.25 mm long. * Avoids light and loves carpets, floor cracks and debris. Young fleas emerge thanks to specific stimuli, and immediate seek a host. The larva transforms into a pupa (U position with a thin 4mm x 2mm cocoon), covered by dust and debris for extra protection. This chart provides information based on averages. Flea infestation happens mainly by exposure to a contaminated environment. There do not seem to be many exchanges of fleas between animals that meet on the street or in a vet’s waiting room. All domestic cats get rid of some fleas each day – they wash, shake themselves, bite them, swallow them, scratch, rub against objects and roll in the dust. The act of grooming dislodges the fleas, except in long-haired cats, young animals, or sick or injured animals. These animals may therefore carry heavy parasitic loads. Fleas can transmit viruses, bacteria (Bartonella henselae, associated with cat scratch disease) or internal parasites (Dipylidium caninum, Dipetalonema reconditum). The cat flea is found on approximately one hundred animals – cats, dogs, wild canidae, rodents, skunks, raccoons, pigs, goats, sheep, possums, humans, and occasionally on calves or horses. * The flea season varies according to geography and climate. * In tropical regions, fleas can be found all year long. * In Canada, fleas seem to be more abundant at the end of the summer and at the beginning of fall. * When fall arrives, each flea wants to find a warm-blooded animal in order to spend winter indoors, since cold and freezing temperatures (under 3°C) kill all stages of the flea in less than 10 days. * Near beaches, sand can promote the development of fleas due to constant humidity. * Inside homes, adult fleas live on animals. Larvae and pupae love carpets, floor cracks and the underside of furniture. After a flea infestation, health problems can occur among both animals and humans. * Skin problems – dermatitis, blisters and redness located near the tail, thighs, abdomen, flank and neck. Redness around the navel can indicate a flea problem. * Allergic reaction after a number of flea bites – This hypersensitivity of the host, especially among dogs, is caused by substances found in flea saliva. * Humans: During the day, fleas bite humans around the feet and ankles. At night they can bite the whole body. The bite creates itching, along with a red area from 1 to 4 mm in diameter in 5 to 30 minutes, followed by a blister (inflammation) within 12 to 24 hours. Once the source of infestation has been eliminated, the lesions heal in one to three weeks. To find out if there are fleas in the house, wear long white socks without shoes in a room for five minutes. The dark flea, which will jump on the feet and ankles, is easy to spot. * Vacuum thoroughly and throw out the bag, since fleas can get out of the bag! * If there are not many fleas, which is often the case with allergic animals, it may be difficult to observe them. * To confirm the diagnosis, check the animal visually for eggs or fleas, dark insects that move quickly. * Place the animal under a powerful light source while separating the fur from the body, especially in the abdominal and groin area. Or use a fine-toothed comb to isolate them. * Look for flea droppings. These dark comma-shaped particles stuck to the skin or fur, are composed of slightly digested blood. Once wet, this brownish blood will become red. So place a sheet of white paper under the animal, brush the fur backwards and look for brownish debris. Or use a wet cotton ball on the skin. A number of treatments are available for cats and dogs, such as sprays, topical substances, collars, substances that can be administered orally, shampoos and powders. More and more often, we are hearing about integrated pest management. Such a program against fleas would use a method for physically destroying the parasites combined with the use of an imagocide. Vacuuming and regularly washing the animal’s bedding destroys the eggs and a large proportion of the other larval stages. The new medications are so effective that most people now adopt a preventive program. With this approach, it is no longer necessary to use insecticides in the animal’s environment. However, certain situations require that the house be treated, such as a high parasitic charge, the absence of animals, and if either the pet or the owner has an allergy to flea bites. Avoid applying insecticides in the house if there is a pregnant woman, a nursing mother, young children (pre-school age), or a person with dermatitis or asthma. * If there is a large infestation, wash the animal’s bedding regularly and dry it on the hot cycle to kill the parasites. * Clean the floors and steam-clean the carpet. * Concentrate your efforts on your pet’s favorite places, such as cushions, easy chairs, the most frequented rooms, bedrooms, living room, and rooms with carpet or wood floors. *Vacuum to remove eggs, larvae and fleas and then burn the vacuum cleaner bag or throw it out in a plastic bag because the fleas can get out of the bag. You could also put moth balls in the plastic bag. No program is 100% effective. At best, the flea population will be maintained at an acceptable minimum. Treat as early as possible depending on the season, climate and animal infestation. In Canada, you can start preventive treatment in May and continue until October or until the first frost. Keep an eye on your pet, because in theory, they can become infected even in the winter. To help with prevention, you could consider limiting your pet’s access to certain rooms. In urban or suburban areas, local wildlife can be a reservoir of infection for our domestic animals. Alain Villeneuve, D.V.M., Ph. D.